The only Caribbean film in the They Shoot Pictures 1000 (not counting films from Cuba) was the first feature by Euzhan Palcy, who went on to become the first Black woman to helm a major Hollywood production (A Dry White Season). 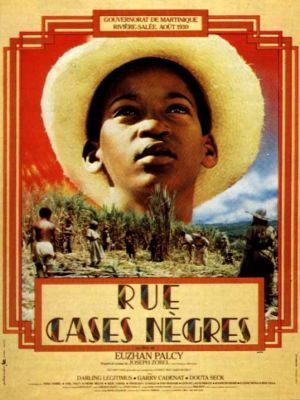 Based on a novel by Joseph Zobel, the film follows a young boy growing up with his grandmother among the sugar cane workers in 1880s Martinique. By a combination of conscientious guidance by his elders and his own talent, he is able to pursue a formal education and rise above consignment to the cane fields. From scene to scene, the film more demonstrative than illustrative -- the sepia compositions and earthy period authenticity barely conceals the rhetoric bent of the film. The episodic narrative feels like a series of object lessons each with a singular point to make about the perils of post-colonial life. The overall effect however is an elaborate discourse on the need for education and artistic expression, not so much to escape poverty but to give voice to it.
. Want to go deeper? In Sugar Cane Alley, Medouze reveals what he considers to be the secret to life, telling Jose, "Don't think that water and fire are enemies ... No! They are the forces of creation. the other to create life." It is precisely this duality which defines the underlying framework of the entire film... Throughout the film, the filmmaker uses cinematic juxtaposition in the dialectic style of Eisenstein to create meaning out of conflict. This style follows the broader theme of life as opposing elements and incorporates it into the construction of the montage. The scenes consistently alternate between night and day. Two scenes in particular, stand out as significant towards one another: the funeral scene, which is immersed in darkness and within which the characters have built a fire, and the scene immediately following it which is shot in bright sunlight and takes place in the water. Not only do they oppose each other in that they feature the conflicting elements of dark and light, fire and water; but the elements of fire and water are specifically the literal examples used by Medouze to explain the paradoxical secret of life. Other examples include the many times in which the difficult and poverty-stricken lifestyle of the black cane field workers is contrasted with comfortable life enjoyed by the wealthy whites. One most obvious example is the scene of Leopold's house, which is richly furnished and features a phonograph playing in the background and Jose's shack with a dirt floor which would seem to the audience to be barely livable. Throughout the film, conflicting themes such as poverty and wealth, light and dark, anger and joy, day and night are consistently juxtaposed to create meaning. Janet Maslin's original New York Times review of the film at the 1984 New Directors/New Films Festival, followed weeks later by a more in-depth write-up by Vincent Canby upon the film's release.